Do cows have a memory for stressful events? We already have a good idea of what happens when animals are stressed: low to no feed intake and poor immune function, but what can producers do to help cattle be ready to cope with a stress event? Stress... it's part of life. Whether it's caused by work, school, neighbors, we all deal with it in our own way and move on. Livestock experience stress too. We tend to focus on stress in calves and feedlot cattle and how that affects performance and ultimately the bottom line. But what about the cows in the pasture? This year’s wildfires and weather have brought it to mind several times; do cows have a memory for stressful events? We already have a good idea of what happens when animals are stressed: low to no feed intake, poor immune function, poor response to vaccines and decreased reproductive performance. The response to stress is driven by cortisol. Cortisol is often called the stress hormone. It’s a steroid hormone produced in the adrenal glands and when it’s released it does a lot more than just increased heart rate and temperatures. Memory is the part we’re going to focus on. Researchers at Oregon State University (OSU) have been studying the memory part of stress events with cattle and wolf encounters in Oregon and Idaho. The reintroduction of grey wolves to Yellowstone National Park has resulted in the wolves dispersing to all parts of the Northwest. Consequently, ranchers face the reality that wolves will prey on their cattle. The economic losses associated with wolf attacks are easy to measure, the lasting effect on the cow is not. In an effort to track, or define, the effect of memory, OSU researchers grouped 100 head in a pen to simulate a wolf encounter. Half of the cattle in the study had been part of a herd that had been attacked by wolves, the other half were naïve to wolves. The pen was scented with wolf urine and calls were played over speakers. German Shepard Dogs were walked around the outside of the pen, as they look similar to a wolf. What they noticed is that the naïve cattle did not show any signs of stress and were curious about the dogs. The cattle who had been part of an attack bunched in a corner, formed a protective circle and appeared to be agitated. Researchers also noted that the cortisol level of those cattle was increased by 30%. A 2010 economic analysis calculated the potential economic loss due to wolves to be $261 per head, half of which is contributed to weight loss and lowered pregnancy rates. You may be wondering, ‘how does this tie back into the wildfires?’ It’s reasonable to assume that cattle who have survived a wildfire would have a similar stress response when they smell smoke, see smoke or fires or hear crackling from any fire. While there isn’t anything that producers can do to prevent a wildfire, excluding the obvious, they can help their cattle be ready to cope with a stress event. Keeping cattle in good body condition and a high plane of nutrition make all the difference when a stress event happens. 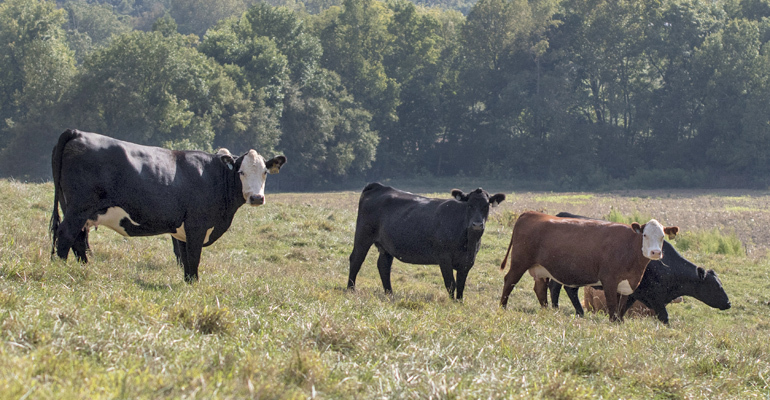 Proper supplementation, year-round, will ensure that cattle are not deficient for key nutrients associated with immune function (Cu, Zn, Se, Vitamin E) and reproductive health (Cu, Zn, Phosphorus). CRYSTALYX® Brand Supplements has the barrel to fit your grazing situation and management type to help reduce the effects of stress on your herd. Research trials, field trials and years of customer experience have shown the convenience, labor savings and proven performance of these products.